Monsters Within is a comprehensive episode guide to Series Four of the new Doctor Who. following the ongoing adventures of the Doctor (David Tennant) as he travels through space and time accompanied by his new companion Donna Noble (Catherine Tate) and rejoined by old friends including Martha Jones (Freema Agyeman), Rose Tyler (Billie Piper), Captain Jack Harkness (John Barrowman) and Sarah Jane Smith (Elisabeth Sladen). The full build-up and background are revealed, from the aftermath of Series Three and the apparent death of the Master (John Simm) right up to date, detailing all the major news stories, press releases, casting announcements and critical response. The spotlight is then focused on each of the 13 episodes in turn, plus the Christmas Special 'Voyage of the Damned', with in-depth coverage, including all the facts and figures, behind-the-scenes details, press and fan reaction and detailed and insightful analysis. The perfect way to relive the Time Lord's encounters with the cute Adipose, the fiery Pyroviles, the terrifying Ood, the warlike Sontarans, famed crime novelist Agatha Christie - and even 'The Doctor's Daughter' - plus the Earth-shattering series finale with the Daleks. 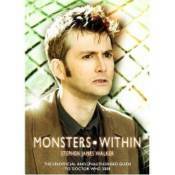 Monsters Within is an essential read for all fans of the show, and continues Telos's unrivalled coverage of Doctor Who.